A place for borrowers to find financing with the right online lender. GET A GREAT RATE ON AN ONLINE LOAN! Applying with our recommended lenders can save you money and time. 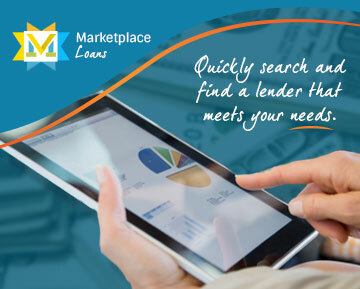 Marketplace Loans showcases great online consumer loan products and services that lenders are providing to borrowers. Many of the loan products are a form of peer to peer lending. Before getting an online loan, borrowers should compare multiple loan offers to guarantee they get the best deal and lowest price. Borrowers are able to read reviews, check interest rates, and take advantage of an eager lender's special discounts. Having access to an internet connection is the only prerequisite, making online loans one of the most affordable and flexible ways to get financing. Comparison shopping lets people find a bargain for online loan products and provides the ability to connect to the most suitable lender. The only problem is there are so many lenders and searching around for the cheapest loan can take a long time. Marketplace Loans combs through online loan products to find the most economical choice, slashing the amount of time it takes for a person to select a loan, get approved, and get cash into their bank account. Start shopping for your right loan with Marketplace Loans and get that money fast! A peer to peer loan or marketplace loan is credit provided by individual investors to borrowers and is typically cheaper than traditional forms of financing. These lenders are independent investors who are willing to financially back borrowers or their 'peers'. This isn't the traditional banking platform your parents used. During this digital revolution and the current connected age, innovative investors overhauled the banking industry, one of the world's oldest businesses. They converted the traditional financial structure to include online lenders that could directly connect them to the borrower. In effect, the new efficient infrastructure has created transparent and simple loan products with lower prices for borrowers and higher returns for investors. According to a Federal Reserve report, this is the percentage of Americans ages 18 and up who own a smart phone and have access to online financial services and products.